MAXSTORE is the popularly known name for the different kinds of the workbenches and workstations also provide finest quality of assembly table. We possess latest fabrication facilities. Combination of modern technology and sincere efforts of our skilled professionals made desired outcome. Our assembly tables are passed through stringent testing for various load and other functions. By our space saving methods all attachments are arranged with a proper specious manner. Finest quality of material and rigid welded joints supports daily use of assembly tables with hassle free operations. Highly durable assembly tables are efficiently works in all kind of environment. They are made by our special space saving technique. They are equipped with monitor stands, adjustable footrests, holder and adjustable shelves. It is also used for the testing and handling of the material. It is also convenient for the standing and sitting arrangement of the operator. Convenient design of assembly tables supports the elbows, forearms and wrist of the operator. Rounded safety edges help operator to move easy. It is favorably used for small working appliances. It is suitable for the sorting system and all type of environment of office and factory. 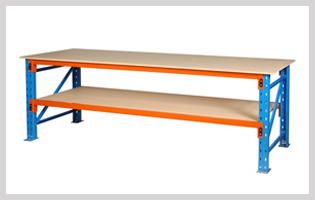 These rich featured assembly tables are useful in streamline products. It is available with various table top options, perforation panels and vices. We offer adjustable shelf for convenient arrangement of respected tools or products. For the assembly, the assembly table tops are made to provide effective protection against the oil, grease, water and dirt. Power supply option is offered for the application of power tools.